When it’s hot outside, that’s when you depend on your air conditioner more than ever. However, if you haven’t taken the time to maintain it during the rest of the year, you could be left out in the heat. Here are a few things that you can do to ensure that your air conditioner is cooling you down when things begin to heat up. Change the filter regularly. Your air conditioner relies on air filters to keep dust from collecting on the coil fins. It also keeps the air flowing through the appliance and cooling your home as it should. If you don’t change it regularly, you could end up breathing in a multitude of allergens, dust, and other bacteria. To be safe, change the filter once a month. That way, you can ensure that your air conditioner is performing as efficiently as possible. Clean your vents and ducts. If your vents are obstructed, the cool air isn’t going to be able to get through. Each year, take the time to vacuum out your ducts and vents. Then, be sure that there aren’t any obstacles preventing the cool air from freely flowing. Move furniture, boxes, and decorations to ensure that your room is being cooled as it should. Invest in a programmable thermostat. If you have a thermostat that isn’t programmable, chances are your system is working overtime. During the day, your air conditioner will need to cool your home to different temperatures. However, if you aren’t home to adjust it, it could end up working more than it should. A programmable thermostat allows your system to adjust itself even if you aren’t at home, saving you money on your energy bill and keeping your system from working too hard. 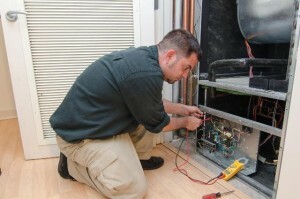 Keeping your air conditioner in working order can keep you cool all year round. If you are having problems with your air conditioning, it’s time to contact someone who specializes in air conditioning repair in Marietta. Then, sit back and laugh at the heat in your nice cool home.